Hello and welcome to a special instalment of my PPTQ diaries. My capacity for writing took a bit of a hit in February, but I’m going to catch you up on lost ground with a summary of the PPTQs I attended and a review of my experience at the RPTQ for Pro Tour Nashville in London (which I qualified for by winning a PPTQ last season). Below is a summary of information from PPTQs I attended since I last wrote. Strengths: Resiliently applies pressure. It plays one mana 3/2s, two mana flying 4/4s, a two mana 3/2 that can recur and a four mana Planeswalker that is not only difficult to deal with, but can end the game quickly when not dealt with. Added to this, Unlicensed Disintegration, which quickly earned the shorthand Murderblaze/Murderbolt, goes a long way in support the threats in applying pressure or getting a two-for-one by redirecting the damage to their Planeswalker. Weaknesses: The manabase is extremely greedy. When looking for inspiration from other lists, I paid great attention to manabase configurations to see if anyone had managed to come up with one more consistent than the next. The deck needs all three colours to fully function. You may need to play Toolcraft Exemplar on turn one, Veteran Motorist on turn two, Unlicensed Disintegration on turn three, or Gideon, Ally of Zendikar on turn four in order to apply enough pressure and win the game. Increasing the number of Needle Spires and Shambling Vent gives you more coloured sources but increases risk of not being able to curve out properly due to having too many taplands. Opportunities: Sideboarding has layers. You can choose to remain aggressive (sideboard little) or transform into more of a Planeswalker-based control deck (sideboard lots). If your opponent catches onto this, it will affect how your opponent might sideboard – how much creature and artifact removal should they board in if you are removing a bunch of these for Planeswalkers? A mind game ensues as they try to figure out if you are on the Planeswalker plan or not and whether overloading on Fatal Push and Release the Gremlins is really worth it. I usually ended up shuffling my whole sideboard in for games two and three and removing fifteen cards. This makes it more difficult for the opponent to guess correctly as it looks a bit more obvious when you are sideboarding exactly twelve cards for the sideboarded games. Threats: It’s actually not hard for people to brew midrange decks that are effective against the Mardu vehicles strategy. Cards like Liliana, the Last Hope, Ishkanah, Grafwidow, Archangel Avacyn, Linvala, the Preserver are all very effective against this deck and mainstays of the previous Standard. Archetypes with these cards are often not strong enough against the Saheeli Rai combo decks so they are somewhat pushed out of the metagame. I did face Green Black Delirium decks with some of these cards along the road and I can attest that Ishkanah being recurred by Liliana, the Last Hope is an absolute nightmare scenario for this deck, which we could see more of if Copycat is banned. Between the above tournaments and playtesting some matchups with friends in anticipation of the RPTQ, I built the following consensus on how the deck matches up against the main players in the standard metagame. Green/Black Constrictor: In game one they are well set up to beat you with larger creatures thanks to Winding Constrictor and the removal to take down Heart of Kiran. You need to try and race them, which obviously helps if you are on the play. Walking Ballista is insane card advantage for them as it can continually pick off Toolcrafts and Motorists. Post-board I like to enact the Planeswalker plan, particularly on the draw. I even bring in a couple of Release the Gremlins to hit Verdurous Gearhulk, although some savvy players play Lifecrafter’s Bestiary and Skysovereign, Consul Flagship from their sideboard when they know you’re on this plan. All things considered, Gideon, Ally of Zendikar is probably the best card in this matchup. Four-colour Saheeli: How well set up you are depends on how much access to Thalia, Heretic Cathar and Shock you are packing. The remainder is very skill intensive. Knowing when you can’t afford to play round the combo to win is really key as, yes, you could hold up Unlicensed Disintegration forever, but it might result in you losing in a couple of turns to their value creatures anyway having not deployed enough pressure. I think Thalia is a great card against them, as it allows you to continue to curve out or make the plays you might normally make without living in as much fear of the combo. She also makes Whirler Virtuoso a lot worse, allowing you to pile on more damage. All things considered, Gideon, Ally of Zendikar is probably the best card in this matchup. Blue/Red/X Dynavolt Tower Control: I have played against a lot of control players who tell me they think their matchup against Mardu Vehicles is favoured, but I’m utterly convinced of the opposite. Mardu applies a ton of pressure and often cards like Radiant Flames and Fumigate are not hugely effective against you due to Heart of Kiran and Gideon. In this matchup I sideboard 2 Release the Gremlins and additional Planeswalkers. They might sideboard out one or more Dynavolt Tower anyway, but there’s nothing sweeter than releasing those gremlins on a Torrential Gearhulk that they think has just saved the day. All things considered, Gideon, Ally of Zendikar is probably the best card in this matchup. Mardu Vehicles: Apply pressure, maximise your mana and expand your board but avoid blow-outs. This summarises the advice given by Lucas Esper Berthoud, winner of Pro Tour Aether Revolt (who also played the deck to a 10-0 finish in the constructed portion of the swiss). In addition to play skill and draw quality, how compliant your manabase is during the match is a huge factor. The player on the play has a big advantage as card like Toolcraft Exemplar and Scrapheap Scrounger are obviously much better on offense than defence – and deploying your Planeswalker (Gideon) before theirs is almost always advantageous. If you had not guessed by now, Gideon, Ally of Zendikar is probably the best card in this matchup. In the run up to the RPTQ there was a Standard Grand Prix. A few of my friends were actually in attendance. Unfortunately my Grand Prix budget is all-in on the Las Vegas GPs in June, plus the GPs taking place in England. I tried to watch as much of the coverage as possible to see what was being played, what was doing well and if any new innovations were coming out of the woodwork. My first port of call after returning from the PPTQ in Blackpool was to check out the decks that went 9-0 on day one. I was very intrigued to see whether the Mardu Ballista deck would continue its momentum into the Top 8 or not. On paper, it looked favourable against the Winding Constrictor decks, the Veteran Motorist version of the mirror and also added four pseudo answers to the Saheeli Combo decks in Walking Ballista. It gave up very little aggressive ground to arrive at this position. In addition, pushing the boat out on the Planeswalker plan by adding Oaths looked a bit all-in, but it makes sense if you are anticipating going on that plan frequently. As I watched more of the coverage, you can imagine how assured I was about the deck when the tournament finished with it taking first, second and third place. New plan! Myself, Rob Catton (Roberto), Gareth Woodhead (Gaz) and Matthew Duggan were all qualified and agreed to test and travel together for the event. We met a few times that week to battle out games among what we thought would be the three most popular decks, Mardu (now this new Ballista version), Four-colour Saheeli and Green/Black. As Matt and Gaz were pretty much locked into playing versions of the Green/Black a lot of the testing involved this deck. I was a bit disappointed that I was not winning literally every post-board match against them with the new Mardu Ballista deck (given that the deck is designed to beat them) but the deck still felt like it was performing fine and left me with a lot of confidence in it. The RPTQ was in London and we decided to travel down the day before and stay overnight, avoiding a mad dash and early start to reach the player meeting in the morning. We took the National Express coach down which was about four and a half hours (but a lot cheaper than driving or taking the train) passing the time by playing the Basic Land Game. Roberto taught me this game a while ago, but it hasn’t been played for a while. I thought it deserved it’s own cameo in this article. All you need to play is seven of each basic land shuffled into a deck. Each player draws four cards for their starting hand. Every turn, a player draws a card and must play a card onto the Battlefield. The aim of the game is to deploy a basic land of each type (obtain WUBRG), the first person to do this wins the game on the spot. Each of the basic lands have special rules, some effects cause other cards to go to the graveyard. Forest – When Forest enters the battlefield, return any card from your graveyard to your hand (Regrowth). Swamp – When Swamp enters the battlefield, look at opponent’s hand, you may choose any card for them to discard (Coercion). Try it! It’s fun and good practice for finding ‘two-for-one’s and planning ahead. We put the Magic Online Championship coverage on in one of the hotel rooms while playing out some final games and writing out decklists. Roberto decided he wanted to switch from Mardu to Temur control, played some games, then promptly switched back to the same list as me. We decided from our testing that three, maybe even only two (but we didn’t want to risk it in case we were wrong) Release the Gremlins was enough. In situations where you want to try and break a Planeswalker stand-off, the gremlins likely would not help. Avacyn sounded like a fantastic alternative but was admittedly a bit of a last-minute addition. Game one: My opponent is on the play. Unfortunately for me he gets the aggressive edge over my Scrapheap Scroungers with a Heart of Kiran which I’m unfortunately unable to remove until it’s too late. I enact the normal sideboarding plan for the mirror when on the play. Game two: I manage to deploy Gideon and make make his Exemplars and Veteran Motorists look embarrassing against multiple Knight Ally tokens. Gideon finishes the game very quickly. I transform into the Planeswalker deck for game three which means I put Chandra back in. Game three: My opponent curves with Toolcraft, Scrapheap, Caravan, Gideon but misses his fourth land drop. I use Release the Gremlins to take out the Caravan and try to stabilise the board. In order to turn the corner, I need to fade a draw step while my opponent is stuck on three lands. Unfortunately he continues to deploy more annoying threats like Pia Nalaar, which I have to get rid of, only for her to be immediately replaced by another one. I eventually get Ob Nixilis onto the table, make a Zombie token with Oath of Liliana and leave the Gremlin to block. It turns out the last two cards in my opponent’s hand are both removal spells and he’s able to clear the blockers away, attacking for lethal. After the match, we talk and it turns out my opponent is a friend of Marcio Carvalho (currently ranked #1 in the World and also championing the Mardu deck). He explained how Marcio helped him tune his list and prepare for the event. I respect Roberto, Gaz and Matt as my playtesting buddies, but I feel my opponent came better prepared. Game one: My opening hand contains two Fatal Push, Unlicensed Disintegration, Gideon and three lands (all colours) but I decide to mulligan this in the dark as it doesn’t apply much pressure. Thank god I do this. My opponent plays some 0 mana artifacts, but is unable to deal with Toolcraft Exemplars, Heart of Kiran and Thalia which make short work of him. Game two: I’m not entirely sure my sideboard plan is correct, but based on what I saw, I still want ways to kill Sram, Senior Edificer and other creatures that might be delaying me enough for the combo to happen. Unfortunately my opponent has to mulligan to five and is decimated quickly. I did actually play against this deck at Aether Revolt Game Day so I knew what cards to expect. Fortunately the Mardu deck is able to apply a ton of pressure to its health total before it can ‘go off’. Game one: My opponent misses their third land drop. The game stalls because his hand is stacked with creature removal, but I eventually deploy Gideon and overwhelm him. I do note the Grasp of Darkness played in game one with Spire of Industry. I enact the usual sideboard plan when on the draw. I board both Ob Nixilis instead of 1 Nahiri, 1 Ob Nixilis as I think my opponent will probably have Archangel Avacyn. Game two: This game is a little closer but I’m able to eke some advantage out of the Oaths while deploying Planeswalkers. He matches walker for walker, but has no Oaths so doesn’t get the extra value and falls behind slightly. I recall some part of the game getting incredibly tricky because we both draw multiple Walking Ballistas. It’s worth noting that if damage has resolved on your Ballista and you choose to remove counters to activate it, yours may die due to state-based effects being applied and you won’t get the chance to remove subsequent counters from it in response. This creates an interesting scenario when both players have a 2/2 Ballista and 4 untapped mana. The straightforward solution of killing theirs with yours and taking maybe one remaining damage from theirs in retaliation removes the complexity, but isn’t always the best line of play. Game one: I am on the draw, but have a good hand and curve out well. My opponent stumbles a bit and succumbs to Gideon backed up by Unlicensed Disintegration. I enact the normal sideboarding plan for the mirror on the draw taking out aggressive cards for Oaths and Planeswalkers. Game two: I pull ahead despite being on the draw again with Walking Ballista, Gideon and Release the Gremlins. My opponent stabilises the board with Avacyn and deals with Gideon. My board is now only a 2/2 Knight Ally token and a 2/2 Walking Ballista to his 2/2 Walking Ballista and Archangel Avacyn. My opponent thinks for a moment, probably deciding whether he wants sacrifice his Walking Ballista to deal me some damage and trigger Avacyn to wipe my board. I think he is afraid of an upkeep Unlicenced Disintegration or maybe even Oath of Liliana dealing with his Avacyn. I have no way to deal with flipped Avacyn currently, but he decides not to go for it. With relief, I untap, deploy a 3/3 Walking Ballista which, in conjunction with the other Ballista takes down Avacyn. We’re now in a bit of a topdeck war, only I am ahead one Knight Ally token and very far ahead on life total. Neither of us draw anything particularly relevant and the Knight gets there. This was covered on the Darksphere Twitch livestream (04:30:29). My opponent returned from Grand Prix Utrecht the previous weekend with an impressive 12-3 finish piloting Mardu Vehicles. It’s sensible for me to assume that’s what he is playing. I am on the draw. Game one: My opening hand has two Scrapheap Scroungers, three Unlicensed Disintegrations and two lands (all colours). I don’t consider this hand the best but I think the chances of me breaking serve are quite slim anyway, and this hand can potentially deal with a turn 4 Gideon from my opponent which is important. Fortunately for me, my opponent has to mulligan to five cards. My opponent does make a decent game out of it mainly with a Gideon, Heart of Kiran and Archangel Avacyn, but I draw the fourth disintegration and a Fatal Push to put him away. I enact the normal sideboarding plan for the mirror on the draw taking out aggressive cards for Oaths and Planeswalkers. Game two: Again, my keep involves at least one Unlicensed Disintegration, which is very important for dealing with Archangel Avacyn. This game has a bit more back and forth and my opponent deals with my Gideon to pull ahead. I’m able to stem the bleeding with Avacyn and add to the clock with Chandra. The main take-away from this match was learning how the Oaths work. I had previously thought that the Oath needs to see the Planeswalker enter the battlefield for the ability to trigger, but upon re-reading the card this appears not to be the case. In the match I played a Chandra and then an Oath of Liliana in the same turn (04:56:20). On camera it looks like I just forgot my trigger (which is pretty bad) but it’s actually worse in that I didn’t even know the card worked that way! I felt very lucky to have won this match. The winner of this one can likely ID into Top 8 which is exciting. Game one: I keep a good seven and am ecstatic when my opponent plays a Wandering Fumarole tapped and passes the turn. If you weren’t already aware, I’m pretty confident with my control matchup. Despite playing it on turn two, I don’t activate my Heart of Kiran into my opponent’s Harnessed Lightning for many turns. My opponent adds Dynavolt Tower to the table, but I use this opportunity to resolve Gideon, Ally of Zendikar. On the turn my opponent tries to turn the corner with Torrential Gearhulk, I have exactly lethal. I’m not too sure about Nahiri as it does compete with both Gideon and Chandra at the 4 slot and doesn’t apply as much pressure. It can, however kill a tapped Dynavolt Tower if you can tempt them to use it in the combat phase. It’s also a random handy answer to Aether Meltdown which my opponent might board in for my Heart of Kiran. Game two: My hand includes 2 Gideons, a Release the Gremlins, a Scrapheap Scrounger and 3 lands, which I consider a good hand. It’s certainly well-equipped enough to deal with an early Dynavolt Tower. Worst case I can also destroy Torrential Gearhulk with the gremlins. My opponent deals with the first Gideon, but I protect the second one from Wandering Fumaroles and Torrential Gearhulks, Eventually, my opponent commits the second Gearhulk in an attempt to eliminate Gideon. However I chump with Heart of Kiran, knowing that Gideon is definitely worth protecting. I untap and cast Release the Gremlins on both his Torrential Gearhulks, which feels insanely sweet, and basically puts the game out of reach for him. Matt finishes 11th and Gaz finishes 9th. It’s been a decent performance for the group. This is their first RPTQ and to see them come so close is reassuring. This is my first RPTQ Top 8 – one step away from the Pro Tour. While it’s technically just the ‘quarterfinals’, I’ve decided to call it a play-off round. I had to explain to multiple friends that the semi-finals and final of this event are not conventionally played out, as the Top 4 earn invitations to the Pro Tour and there are no prizes beyond that. Imagine a normal Magic tournament with a Top 8, but after the quarter finals everyone goes home. My opponent went 5-0-2 in the swiss (2nd seed) and is on the play. I have seen him play other matches today and know he is on Mardu. Game 1: We both have to mulligan. I keep a hand with 2 Gideons, Thraben Inspector, Fatal Push and two lands. I scry a land to the top. My opponent plays around the Fatal Push very well, never exposing his Heart of Kiran. He gets his Gideon down before me and deals with both of mine with his board advantage. I enact the normal sideboarding plan for the mirror on the play. Game two: I mulligan to six, my opponent keeps seven. My hand is Plains, Thraben Inspector, 2 Scrapheap Scroungers, Heart of Kiran and Release the Gremlins. I really don’t want to go to five cards on the play despite there being better five card hands in there somewhere, but I think I was overly influenced to keep this hand based on the speed at which my opponent chose to keep his seven before I mulliganed – he had to give it some thought. I convinced myself that my best chance to win this game was to scry my second land to the top, or draw one on turn two and go all in on the aggressive plan. It didn’t work! I drew no lands until about turn four or five. My opponent has a normal draw and destroys me. Overall it probably was a bad keep. I saw from my opponent in round five that a mulligan to five can still yield decent draws, but Veteran Motorist helped him with this and I’m not running any of that card. I guess perhaps the discipline element is something I need to keep working on. Roberto wins his play-off round and qualifies for the Pro Tour! Even better, he offers to buy me, Matt and Gaz dinner – we have just under an hour until the coach leaves so it’s probably Subway or whatever we can find on the way to the coach. Preparation pays off: I’m definitely glad that, as a group, we helped each other out and did some research to at least have clear understandings of how the different decks functioned and solid sideboard plans. Not sideboarding properly is a development area for me. I used to be completely awful at it, but now I think I’m getting a better grip on it and this has been helped massively by the group preparation and research (watching coverage). RTFC: I’m pretty shocked that I didn’t know how Oaths worked. One way I prepare for limited GPs is making sure I know what all the new cards do, not sure why I didn’t do same for this constructed event. That’s the complacency that constructed brings, I guess – you assume you know what your cards do and never check! It was great – I’d recommend it going forward. I think we should have played more Avacyns – that card impressed me! I would probably move the Chandras to the sideboard in favour of two Avacyns and dropping a Release the Gremlins (two is likely still fine) – or maybe only playing a single Chandra as Black/Green is on the decline. I also think the Oaths plan was fine, but now that people are aware of it and will likely run more Avacyns, Oath of Chandra definitely loses value. I think the manabase is still to be improved – four Aether Hubs felt a bit risky, so maybe more Shambling Vent is the way to go. Now that we are moving away from Chandra, the tax on red is a little less so I can see cutting a Mountain or two for them. Gideon is still the best card. My losses involved my opponents having Gideon advantage, and most of my wins involved me having Gideon and using it to kill my opponent in a short space of time. Props: I’d like to issue props to Roberto, Matt and Gaz for making the prep, the trip and the event a great experience! I’m sure I’d still be saying this even if we all went 0-2 and dropped! Making the Top 8 at this event has given me a bit more confidence that I can compete with some of the best players in the country (despite some terrible technical play errors). 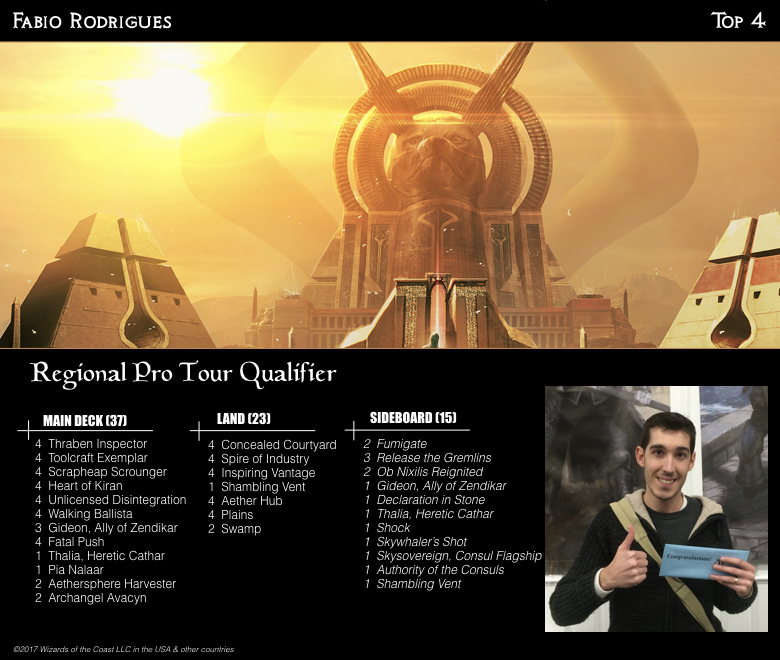 It also means that I’m now qualified for the next RPTQ, so I can’t attend any more PPTQs this season. This brings the PPTQ diaries to a close (without me actually winning a PPTQ) but I will bring you some event coverage of differing flavour in the future!